An original addition to the beloved Beauty and the Beast fairytale, Lost in a Book follows the lonely, bookish Belle as she finds an enchanted book in the Beast’s library called “Nevermore” that carries her into a glittering new world and the life she’s always dreamed of. But Nevermore is not what it seems, and the more time Belle spends there, the harder it is to leave. Get Lost in a Book! Order from Amazon, Barnes and Noble, or your local independent bookstore. Good stories take hold of us and never let us go, and once Belle becomes lost in this book, she may never find her way out again. Smart, bookish Belle, a captive in the Beast’s castle, has become accustomed to her new home and has befriended its inhabitants. When she comes upon Nevermore, an enchanted book unlike anything else she has seen in the castle, Belle finds herself pulled into its pages and transported to a world of glamour and intrigue. The adventures Belle has always imagined, the dreams she was forced to give up when she was a prisoner, seem within reach again. The charming and mysterious characters Belle meets within the pages of Nevermore offer her sparkling conversation, a life of dazzling Parisian luxury, and even a reunion she never thought possible. Here Belle can have everything she has ever wished for. Be what about her friends in the castle? Can Belle trust her new companions inside the pages of Nevermore? Is Nevermore’s world even real? Belle must uncover the truth about the book before she loses herself in it forever. If I was reborn a Disney princess, I’d be Belle. No question about it. Don’t get me wrong: I relate to Ariel’s love of the sea (can you say Waterfire Saga? ), and I covet the perfect, life-changing outfit every bit as much as Cinderella. But when Wikipedia adds an entry for “Nerdy Feminist Bookworm,” it will have two names: Jennifer Donnelly and Belle. So when Disney asked me to write an original story about what happens to Belle away from the arc of the classic fairytale, what goes on in her inner life, among her thoughts, hopes, fears, and fantasies, there was no way I could possibly say no. I’ve written quite a few books in many genres and under various circumstances, but this one was different. It was an amazing experience to write an original story that weaves around and through a classic fairytale beloved by millions (the 2017 film broke records for Disney at the box office — watch the gorgeous trailer here). It’s fascinating — but challenging, as you can imagine. The original story is like gravity: always there and unchangeable. It has also been exciting to really get to know these characters over the past few months as I wrote and edited the book — Belle in particular. She and I have become extremely close, and there’s a lot more to her than I ever realized or appreciated. She has taught me so much, as all my characters do, and she will join Alexandrine, and Mattie, and Fiona, and Serafina in a very special place in my heart. Buy Lost in a Book at Amazon.com, Barnes and Noble, or your local independent bookstore. 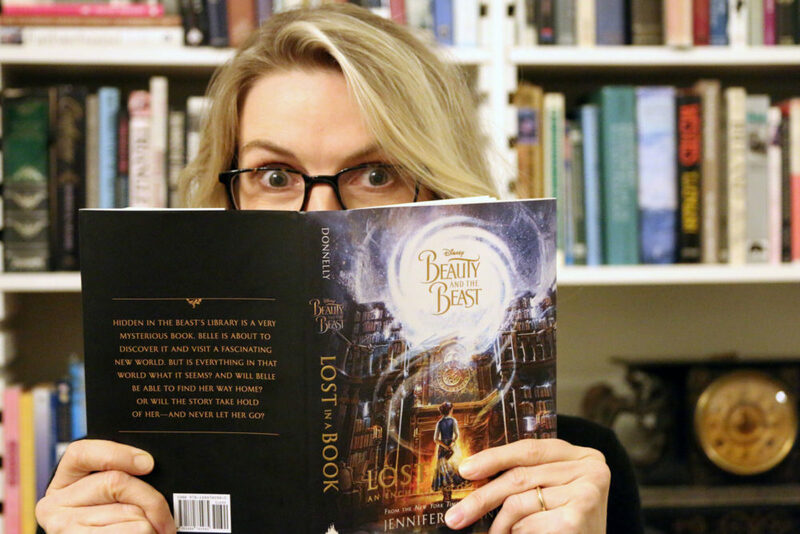 Is there any news yet when Beauty and the Beast Lost in a Book will get translated to Dutch? I read it in english I loved it! But my mom wants to read it in dutch. I’m afraid I don’t know — but if I get any news on that front, I’ll share it! Will you be writing more with Disney? Will “Lost in a Book” become a series? No immediate plans for a sequel/series, but I never say never! If you want to see more of my work with Disney, check out the Waterfire Saga (book one is called Deep Blue). I’m currently working with Scholastic (publisher of Harry Potter, The Hunger Games, etc.) on a new novel called Stepsister — about Cinderella’s ugly stepsister and what becomes of her after the glass slipper ordeal. It will be out next year! I love ‘Lost in a Book!’ I couldn’t put it down! I had to reread it again! What an awesome twist to the original Beauty and the Beast movie. I can’t wait for ‘Stepsister!’ Thank you, Ms. Donnelly! I love the book jacket/cover art, who did it? The amazing graphic artists at Disney!! Please, please, pleaseee write a sequel! I am begging you! One of the most well written books I have ever read! Please don’t leave me hanging! Will you make any more disney based books because this one is awesome? Is there any Hindi edition of Lost in a Book. I do not believe there is a Hindi edition, but if I get news of one in the works, I will let you know!